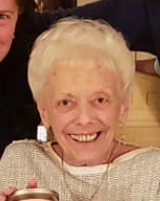 PARKER, Pegge A. of Quincy, formerly of Dorchester, on January 28, 2019. Beloved daughter of the late Albert J. & Jeannette A. Parker. Dear sister of Gloria Mazzaferro of CT. Caring aunt of Paul & Michael Mazzaferro. Former owner of the Pegge Parker Dance Academy in Neponset. Visiting hours in the John J. O’Connor & Son Funeral Home, 740 Adams St. (near Gallivan Blvd.) DORCHESTER, Friday February 8, 2019 from 4-8pm. Funeral Mass in St. Ann’s Church, NEPONSET, Saturday morning February 9, 2019 at 10 o’clock. Relatives & friends are respectfully invited. Interment in Knollwood Memorial Park, CANTON.